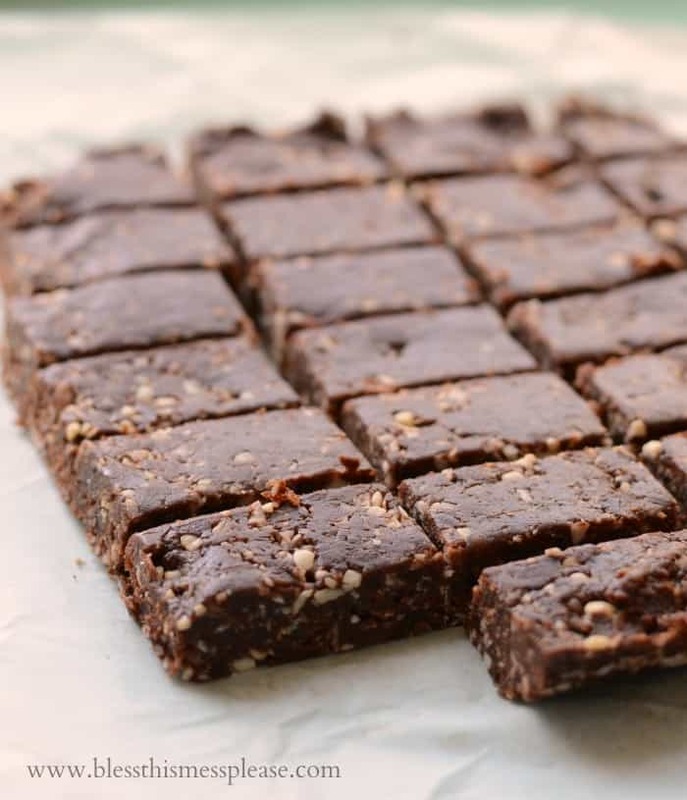 Recipes > Breakfast & Muffins > Healthy Snack Bars – naturally sweetened and good for you too! These healthy snack bars are vegan, raw, gluten-free, dairy free, egg free, Paleo and Whole30 compliant, and just pretty darn good for you. Don’t let all the health labels scare you, they taste great! This recipe is adapted from One Lovely Life’s Healthy Almond Joy Bars and I’m so happy I tried it. These little bars are the perfect craving buster, pack well in lunches, and are best right out of the fridge or freezer. They taste a whole lot like a candy bar without the guilt. The best part is they are pretty filling. I might eat one or two small pieces for breakfast with a big glass of water when I’m in a hurry and I’ll be fine until morning snacks. I highly recommend making them and keeping them in the freezer. 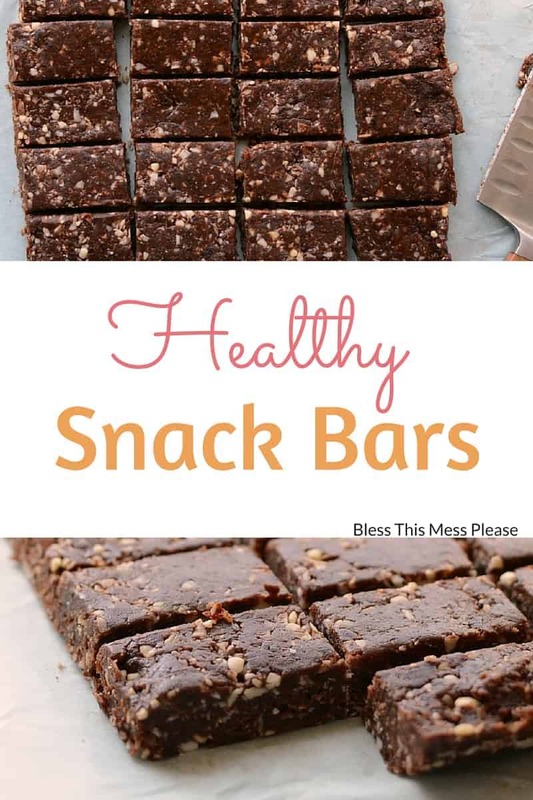 It’s so nice to have healthy snack bars ready when you need them. Don’t let the dates scare you. They are kind of an odd ingredient but very easy to find (I get Medjool dates at Costco) and are a great natural sugar. I promise you’ll never know that you are eating dates once they are all mixed in with the rest of the ingredients. Just don’t forget to take out the pits. The first time I used them I forgot and almost ruined my food processor! Date pits are hard as rocks. Oops. If you try this recipe, let me know what you think! Leave a comment, pin it, and don’t forget to tag a picture #blessthismesseats on Instagram. I love to see your kitchen skills in action! 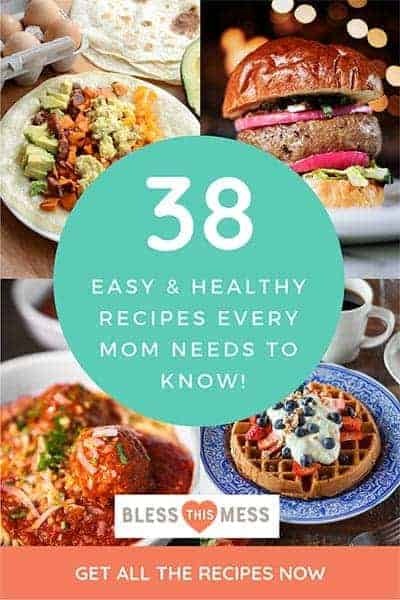 This was a guest post over at Super Healthy Kids a few weeks ago and it was so interesting to see how their readers reacted to it. All I have to say is I wouldn’t trade you guys for anything. You are kind and helpful and I like you best. These look wonderful! Larabars are my favorite, and I love making homemade versions of store-bought items. I bet they are so good with the cocoa powder! I love Larabars always looking for new recipes. Thank you! Love your stuff! Than you friend! So glad to connect! These were delicious ! They were like a cross between Almond Joys and Reese’s cups: my two favorites!! Thank you!! Does anyone have the nutrition facts by chance? Mine didnt get hard… even in the freezer. Any tips? Hmmm. What kind of dates did you use? Those are kind of the “glue”. I’d add more PB personally until it was sticky! 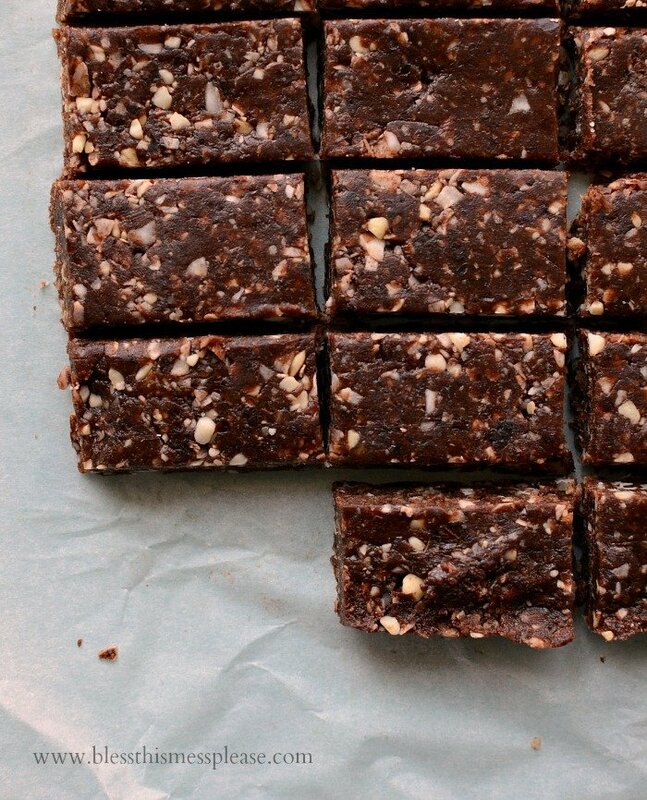 28 of the Most Scrumptious Paleo Snacks Ever! I’ve done dates, 1 cup almonds and 1 cup pecans. They taste like pecan pie! So yummy! I tried the figs. I think they are a little dryer than dates but I love the flavour. (Sometimes dates can be just too much.) I will maybe add more peanut butter next time. I would love to make something like this to throw in my daughter’s lunch kit for snack time….but our school has a no nut policy! Any ideas on how to make something like this that is nut-free? Ugh. I’ve heard about that kind of things and it sounds hard! I live in a tiny town and we are still allowed to bring homemade treats for brithdays 🙂 It helps when the grades have about 20 kids in each, total! That being said, I’m no help. It’s so nut heavy…. You could just try chocolate and dates but it would be really stick and I think the taste would be too much of one thing. I’m going to ponder this. What about coconut? Maybe you could go really heave on coconut? I made something similar to these for my daughters lunch using raisins and shredded coconut and sunflower seeds. I rolled them into balls instead of cutting into squares but they were a hit! I like the date/nut combo more personally but as a nut free version the raisin was great. Are you supposed to use dry dates or fresh? Are the dates they sell at Costco dried? I assume that’s what they are, they are all dark and raisin like. I’m not sure I’ve ever even seen a fresh date! Ended up making them with dried. You can get fresh some places. These are amazing! I loved them. Will for sure be making them again. Thanks! I will admit my initial skepticism, but I was determined to make a healthy snack bar so I made these anyway. Can I tell you how much I LOVE them? I’ve been converted. I am a believer. Oh my heavens they are delicious. I eat a little piece in place of dessert sometimes and it fills the craving perfectly. I’m also a college student (I believe they call me a “mature” college student but I don’t fee terribly mature *snicker*) and so I wanted to find a healthy option that I could eat on the go. I do not want to succumb to the vending machines or other fast food options when I am hungry, so these are a perfect addition to my healthy portable snack options. I’m also a distance runner and I was thinking these will be perfect after a long run. Thank you for sharing this recipe. I love it and I will be making it for years to come. Love this!! Thank you for taking the time to write a great comment, totally made my day! WOW! These looks so yumme. Both the chia and flax seed help them stay together better too. 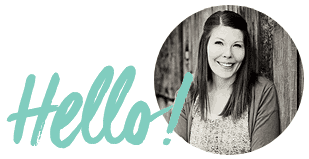 You’ll love the additions! You can just just about any nut for the cashews, it all works great! Its very yummy but my bars are very oily do you know why? Sometimes if you over process the nuts they start to turn into nut butter instead of just the chopped nuts. I bet that’s what happened in your case! I made this today and they are very good. I used shelled pistachios and added chia seeds. Amazingly easy and delicious! Sounds delicious! Thanks for sharing your fun variation! Love, love, love this recipe! 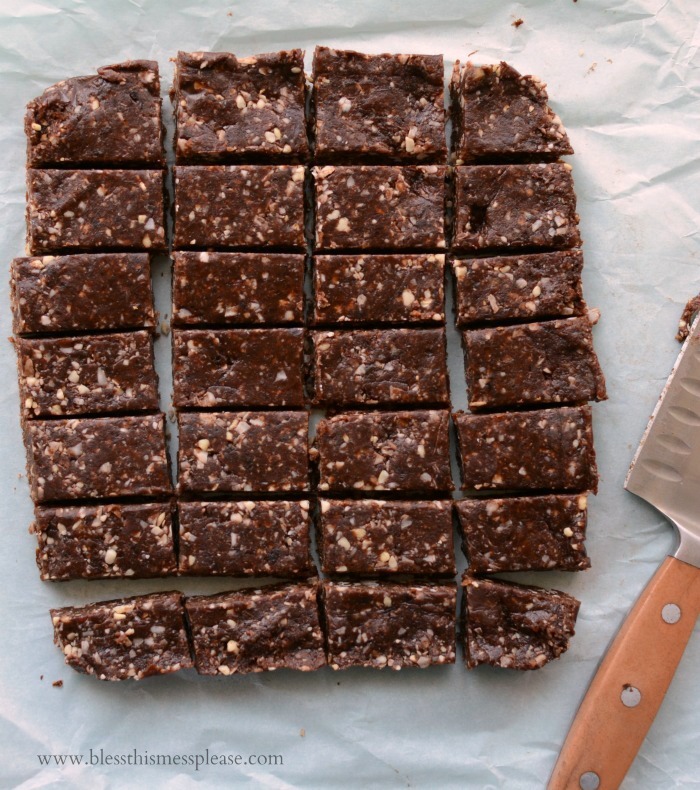 Dates + cashews are a perfect combo and no bake is my favorite thing ever! I need to try these for sure. ENJOY!!! Happy snacks bars to you friend, they are so good!